2019 Judge Applications - Now Open! The Judge Application is now open! If you're interested in judging this year, please submit an application. Do you have questions about being a judge or the application process? Please send us an email at judging [AT] igem [DOT] org with your concerns / questions and we'll help you out! We recently announced several exciting changes to the iGEM 2019 Competition. These changes reflect the next step in moving towards our vision of synthetic biology -- one where you don't have to manipulate your DNA and instead can focus on the information, documentation, and characterization of your parts. We're happy to share this vision with you and we invite you to join us in making it a reality. Read more at https://igem.org/Vision. With technologies ever changing, iGEM is changing too. For 2019, we are removing the requirement for teams to submit physical samples of their parts to HQ. We are now accepting parts in the Type IIS standard alongside the usual BioBrick RFC standard. We are also including samples of Type IIS parts in Kit Plate 6 of the DNA Distribution Kit. These combined changes will give teams more flexibility, and allow teams to be closer to the cutting edge than ever before. 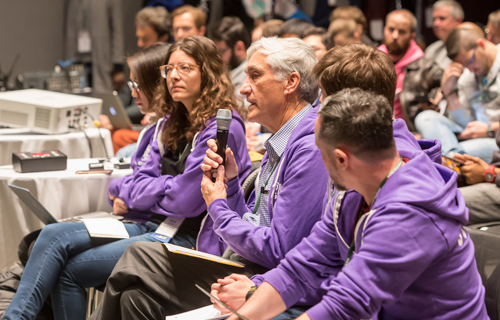 The Economist journalist, Oliver Morton, attended the iGEM 2018 Giant Jamboree. His subsequent piece titled, 'The engineering of living organisms could soon start changing everything' came out in the Economist this spring. Missed out on regular registration? There's still time to join! 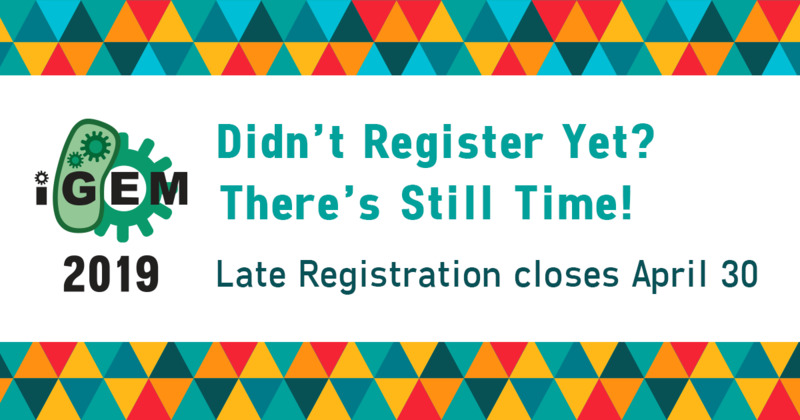 Late Registration is now available, and closes on April 30. Our phone is back online. You can reach us at +1-617-500-3106. Register and pay for your team before April 2 to avoid the $500 late registration fee. Regular registration is closing in two weeks! Register and pay for your team before March 31st to avoid the $500 late registration fee. What is the most popular competition track? How many teams work in chassis other than E. coli? What are the most important research trends in iGEM? Get answers to these questions and many more in the newly published iGEM 2018 Annual Report. The day we've all been waiting for is finally here! Team registration for the 2019 Competition is now officially open. Visit the registration information page for instructions, including information about deadlines, fees, and other materials you'll need to register your team. We will be opening team registration in Mid-February! Regular registration for 2019 teams will be $5,000 USD. 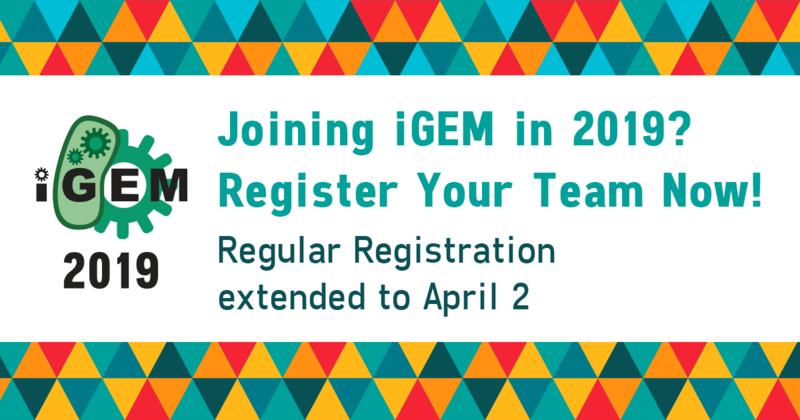 We will send out the announcement through our Newsletter, so please sign up for the Newsletter to get the latest updates about iGEM 2019! You can see previous Newsletters and sign-up to receive them here: http://igem.org/Newsletters. 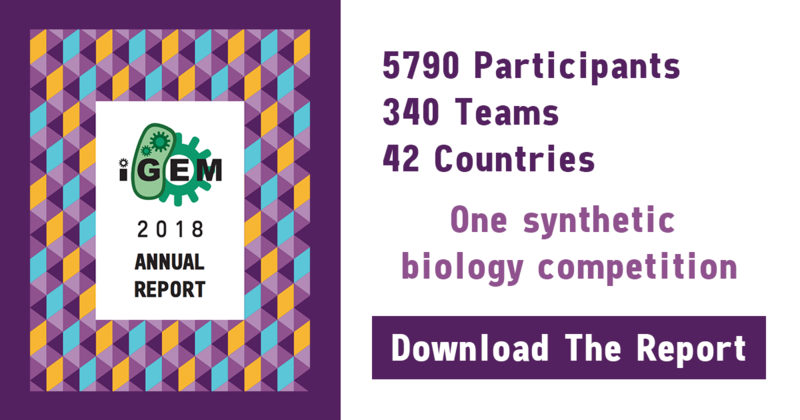 2019.igem.org will be your key resource for all competition related details and announcements. Visit this page often for news and updates. To get started, learn about competition requirements and registration by visiting 2019.igem.org/Competition.